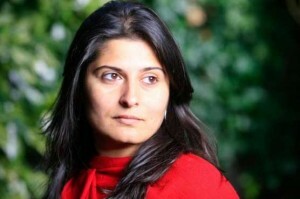 The Oscar award-winning Pakistani-Canadian journalist and documentary filmmaker, Sharmeen Obaid Chinoy, having created waves of late, has another feather added to her cap with her selection for the Wonder Women of the Year Awards 2012 to be held at Hotel Pearl Continental, Karachi, on March 8. Besides Sharmeen Obaid Chinoy, those having been selected for the Wonder Women of the Year Awards 2012 are Nargis Sethi (Civil Service), Salma Ataullah Jan (Politics), Dr Fehmida Mirza (Politics), Fatima Surriya Bajia (Playwright), Nasira Wazir Ali (Educationist), Nusrat Bhutto (Politics), Bushra Ansari (Television), Bushra Rahman (Literature), Sheema Kirmani (Classical Dance), Asma Jahangir (Human Rights), Justice Majida Rizvi (Law & Justice), Musarrat Misbah (Cosmetologist), Salima Hashmey (Artist/Painter), Sofia Qasim Kasuri (Education), Khanum Tayyaba Bukhari (Religious Scholar), Roshan-e-Zafar (Banking), Captain Tarana Saleem (Commercial Flying), Sadia Naveed (Entrepreneur), Nasim Hameed (Athletics), Dr Shahnaz Dar (Medicine) and St Julie Martha Pacheco (Social Services). The award winners of the Wonder Women of the Year Awards 2012 were announced by Shaikh Rashid Alam, Chief Executive Officer, National Hero Foundation (NHF), in a media briefing at the Karachi Press Club (KPC) on March 2. The Najeeb Ahmed Terrace of the KPC was tastefully decorated for the media launch of the second Wonder Women of the Year Awards 2012 with the top officials of the NHF taking the centre-stage. Besides CEO Shaikh Rashid Alam, the NHF Governing Council members present on the occasion were Mohammad Shakil Khan, Syed Khurshid Akbar Shah, Abdul Hafeez Subhani and Huma Bukhari. 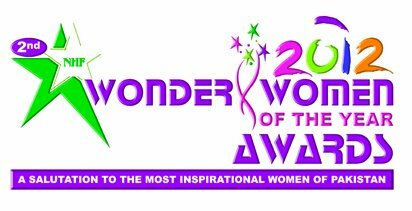 Shaikh Rashid Alam explained that the Wonder Women of the Year Awards 2012 have been classified in three different categories namely Women Icon, Women Pride and Women of Inspiration. He disclosed that Nargis Sethi, Salma Ataullah Jan, Dr Fehmida Mirza have been selected as Women Icons while Fatima Surriya Bajia, Nasira Wazir Ali, Sharmeen Obaid Chinoy and Nusrat Bhutto have been slotted in the category of Women Pride while the others have been classified in the category of Women of Inspiration. He also revealed that for the first time an overseas Pakistani, Salma Ataullah Jan, Member Canadian Senate, have made it to the list. Shaikh Rashid Alam stated that a grand ceremony will be held to present the Wonder Women of the Year Awards 2012 at Hotel Pearl Continental, Karachi, on March 8, which is also International Women Day. The ceremony, he added, will be presided over by Dr Fehimda Mirza, Speaker, National Assembly, while the guests of honour will include Abdul Sattar Edhi, a renowned social worker, Hameedullah Jan Afridi, Member National Assembly from FATA, and Mahmood Sham, a veteran journalist. The Wonder Women of the Year Awards 2012, being organized by the National Hero Foundation (NHF), is being co-sponsored by Daily Pakistan Observer, while its supporters include Government of Pakistan, Federation of Pakistan Chambers of Commerce (FPCCI), Brand of the Year Awards, 3 Woogle and SMS Business Ltd.